Well-established and highly respected in the real estate, development and building industries in our mountain communities, our company is a dynamic team of highly experienced professionals completely dedicated to delivering only the best. We continue to expand our professional affiliations, keeping abreast of the latest technologies and techniques, always perfecting our knowledge of the craft. This translates to an exceptional experience for our customers. In fact, we can proudly say that the majority of our business comes from past client referrals. Bud has been involved in development, real estate and construction for over 30 years. He has a clear understanding of what it takes to build a quality luxury home in the mountains. He has an eye for land and has development and managed an excellent team of subcontractors. He has a high level of integrity and is total dedicated to customer satisfaction. Bud is very active in the community (Conifer Chamber President, 2010) and was instrumental in designing and developing a highly regarded community development that was awarded “Best Sustainable Growth Community” as well as “Best Residential Community” by Jefferson County, the largest county in the Denver area. 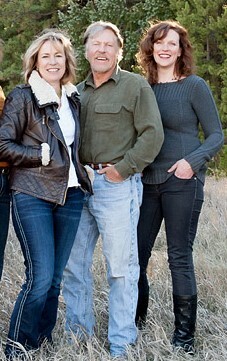 Bud is a licensed real estate broker in the state of Colorado. Bud also serves on the Jefferson County RAC (Regulatory Advisory Committee) as a result of his excellent reputation with county building and development officials. Bud continues his quest for sustainable and energy efficient homes through continuing education programs and seminars. We were one of the first builders in the area to have energy star (EStar) rated homes and now Green homes certifications. Claire has been involved with finance, financial systems and budgeting for over 30 years and in her past life was Director of Risk Management for the Denver Division of Safeway. Her background is in budgeting, forecasting, risk management, accounting and personnel management, residential and land sales and of course, new construction. She is detail and process oriented and works hard with clients to establish realistic goals and the best possible fit for a home in the mountains. She works closely with clients on financial goals to help them determine if they should purchase land and construct a new home or purchase an existing home. Claire loves working with Buyers, new or experienced, and loves introducing them to our mountain community. She is very knowledgeable on land, new construction and remodels and understands septic systems, wells, soils and other mountain specific information. She has been a licensed broker in the state of Colorado since 1998 and appreciates her many referrals from past clients that she has represented on both purchases and sales. Communication and managing details are primary focuses. Having fun doing it is another! Angela joined the Mountain Realty & Development team in 2005 as our office manager and then as an Associate Broker in 2015 to assist with your real estate needs! As our past office manager, Angela knows the ins and outs of land acquisition and new home construction. She has also been involved in many remodels and can assist you with any path you choose to take. As everyone on our team, her focus is on great customer service and communication and sharing the love of our mountain communities. Katherine Fleet has been in the Evergreen Community for over 35 years. She has been in Real Estate Sales, Building and Development for 30 of those years. Her knowledge of the Community and Real Estate has made her one of the most respected and sought after agents in the foothills area. Mountain properties have unique qualities and buyers and sellers will benefit from her knowledge of wells, septic systems and neighborhood locations. Katherine will help explain every step of your real estate transaction giving you a comfort level that will put you at ease. She enjoys her work and the life time friends that come with the job well done.